Greece is stuck. It has fulfilled nearly every demand of the official creditors. Most recently, it agreed to cut some pensions and raise some taxes after the current aid package expires around the middle of next year. This agreement will free up the next tranche of payment so that Greece can make a large debt service payment (~7 bln euros) next month. However, the underlying situation is not resolved, and until it is, the challenge posed by Greece will continue to occasionally threaten to destabilize Europe. What no one wants to talk about is how Greece can continue to service its debt without the charade continuing of the creditors lending the country money. It needs to be able to get funds from international investors, which is to say it needs to be able to sell bonds. Many investors seem to agree with the IMF that Greece’s debt burden is not sustainable. While there may be a few exceptions, many global investors are reluctant to buy Greek bonds. Greece’s debt burden needs to be lightened, but political considerations in Europe prevent it. The eurozone finance ministers proposed extending some loans by 15 years, but the IMF says this is not sufficient. The finance ministers want to wait until after the current aid program ends to determine if debt relief is needed. 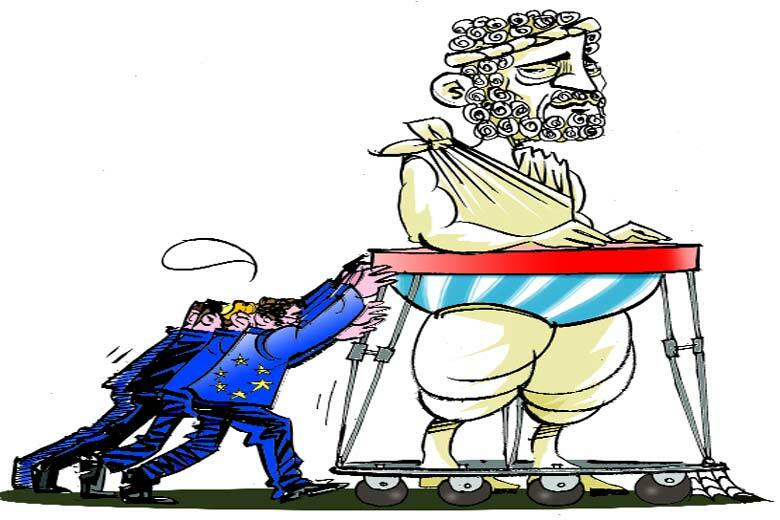 If this is the case, then we suspect that Greece is going to need a fourth aid package. Yet it is also difficult without the IMF’s participation, which is required by the German and Dutch parliaments. The ECB has refused to include Greek bonds in its asset purchase program. Since Greece is in good standing with its aid package, it is not unreasonable, based on previous indications, that the ECB could buy Greek bonds. However, the ECB is reluctant until the debt situation is addressed. In order to avoid confronting the stark fact that Greece cannot pay back its debt, all sorts of fanciful proposals have been suggested to make the situation seem sustainable. It is not clear who really believes the story, but the status quo needs it. For example, the debt could be sustainable if Greece simply ran a large enough primary surplus (budget balance excluding interest payments) for long enough. In this vein, the ECB reportedly argued last week that Greece can run a primary budget surplus around 3.5% for years to come. The IMF is skeptical. The ECB noted that Finland and Denmark recorded primary budget surpluses greater than 5% per year for 11 and 26 years respectively. Without going into a historical exegesis, suffice it is to say that the conditions in Greece are such that make the comparison to Denmark and Finland suspect, to say the least. If for no other reason, note than the Greek economy is contracting. After expanding in Q2 16 and Q3 16, the economy shrank 1.2% in Q4 and 0.1% in Q1 17. That Q1 estimate is likely to be confirmed tomorrow. The reason that Greece continues to make the headlines is that its problems have not been addressed. rime Minister Tsipras has accepted nearly every demand for the official creditors over the past two years. The days of resistance are over. Tsipras has become both pliant and compliant. But the reason that the debt problem needs to be addressed is not out of altruism or some sense of morality, but because Europe cannot get closure on the crisis until Greece can stand on its own. Germany has never wanted to have it taxpayers take a haircut on loans to Greece, and the proximity of the fall election is the latest unspoken excuse. It was not Greece that put German taxpayers (or French or Italian taxpayers) on the line. It did sell bonds to foreign investors who freely bought them. However, European officials decided several years ago Greece would not be allowed to default. The legacy of bad debt continues to hamper a broader recovery in the euro area. Europeans still seem to treat debt as a moral issue. This in turn prevents resolving the issue. Many observers continue to talk about the need for fiscal union to complement monetary union. Others argue for a deeper banking union or a complete monetary union. This all makes sense, but it would still not resolve Greece’s problems (or the problem of old debts that hang over several other countries as well). Europe needs better bankruptcy rules. For many years, China’s reluctance to allow debt failures was seen as a weakness, not a strength. Similarly, the IMF and many global banks have extensive experience in dealing with sovereigns who cannot make good on their debt. Europe needs to get over itself. Just like the dealing with the Greek crisis in 2010 and 2011 were instrumental in the EU and ECB institutional capacity building, so too now, Greece offers Europe an opportunity to put into place the procedures to address solvency for states, which as we have learned, is not made impossible by a common currency. Given the cast of characters and political considerations, this is too much. No further debt relief is likely to be announced at the next meeting of European finance minister in the middle of the month. None dare mention it now, this side of the German elections, but the price of this evasion will be that Greece is likely to need another assistance package in the middle of next year.